Day 27: Treasure | You Can Shake the Gates! Day 27: Treasure – You Can Shake the Gates! Imagine being intimately connected to the most powerful people in your country–people who have the power to give you access to vast wealth, insider deals, government contracts, and protection in dangerous days. Imagine having untold millions at your disposal to put to use to make yourself even more wealthy. Then imagine 1,200 faces: hollow eyes, skin pale and bodies emaciated, pleading with those hollow eyes for mercy and rescue. You can either hoard the wealth and live for yourself or rescue 1,200 people from certain death. This was Oskar Schindler’s dilemma. If you are acquainted with the now famous story of Oskar Schindler (1982 novel Schindler’s Ark, 1993 movie, Schindler’s List), then you know that Schindler chose the lives of 1,200 Jews over his own life. Schindler was known as a serial adulterer, an opportunist, a dedicated Nazi who was even a Nazi spy who was jailed in 1938 on charges of spying for the Nazi government; not exactly a paragon of moral uprightness. Yet he chose to risk his own life to rescue the Jews who worked in his factories. Schindler’s use of treasure ceased to be conspicuous consumption and became conspicuous compassion. The average US household credit card debt stands at $15,279, the result of a small number of deeply indebted households forcing up the numbers. Based on an analysis of Federal Reserve statistics and other government data, the average household owes $7,128 on their cards; looking only at indebted households, the average outstanding balance rises to $15,279. The negative impact that both continual media exposure and enslavement to indebtedness have on our affection for God, his Kingdom, and his priorities for our treasure. How does Schindler’s story or the average American credit card debt relate to missions or Bible translation? Every dollar spent or charged represents an opportunity to choose to be aligned with God’s priorities for our stewardship of resources or to be aligned with the world system’s priorities for our stewardship. James is clear, “Friendship with the world is enmity toward God.” Every time we make this world’s priorities our own by choosing alignment with it, we choose to befriend the world system. Every time we choose to allow God’s priorities to be my priorities for stewardship, we choose to befriend God. Schindler stared into the eyes of 1,200 Jews and risked everything to rescue them from the gas chambers. There are nights when I wake, having dreamed in another language, seeing 4,000 men, women, and children in peril. Without the word of God in their heart language, they face an uncertain eternity. Angela and I are haunted by this vision of a people without access to real treasure, God’s Word, marching into eternity unprepared. This vision is double-edged, though. We are drawn along by the Spirit of God to obedience and pushed along by the possibility of eternal damnation of friends, neighbors, loved ones. However, we cannot do it alone. Unlike Schindler, we have not amassed vast wealth to spend to rescue them. God has provided the Church, His Body, to resource this rescue, this alignment with the Great Commission in translating the New Testament into the language of their hearts. Is God drawing you? To pray? Join the prayer team and stand in the gap for these who need the Bible in their heart language. To provide? Join Pioneer Bible Translators in sending us to the Somau Garia people to complete the translation of the New Testament that we began in 1997. 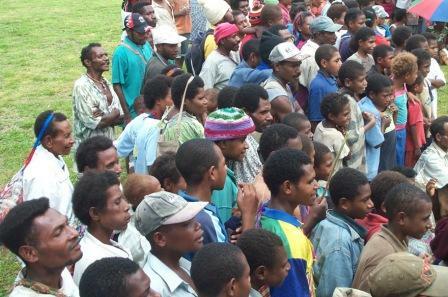 This entry was posted in Ministry News & Opportunities, Shake the Gates Press, Uncategorized and tagged cross-cultural, dream, mercy, Papua New Guinea, Somau Garia, translation. Bookmark the permalink. This message is so important in these last days. What a powerful message!! The truth shall set us free!!! Let these words set us free of the lies spoken to us by the world.